The on-demand car service company Uber Technologies Inc. made waves again last week when it raised $1.2 billion at a company valuation of approximately $18.2 billion. Naturally, that huge valuation once again created speculation of an Uber IPO. Shortly following the announcement, Uber Chief Executive Officer Travis Kalanick spoke with The Wall Street Journal and denied that an initial public offering was on the immediate horizon. But when a company raises as much money and grows as quickly as Uber has, it's only a matter of time before it holds an IPO. The company stated that the $1.2 billion it raised came from a consortium of investors, with Fidelity Investments making the largest contribution. The $18.2 billion valuation is huge and places Uber at the top of the list of companies that have been funded by venture capitalists. 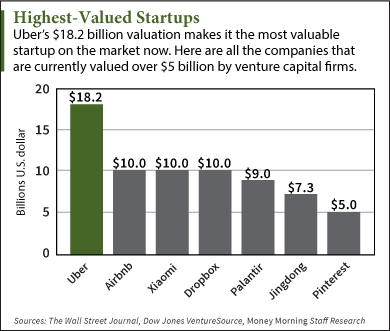 In fact, the current second-highest valued startup, Airbnb, isn't even close, with an estimated value of $10 billion. The vacation and home rental company, founded in 2008, raised $800 million in its last round of fundraising. The Chinese mobile-phone company Xiaomi Technology and the web storage and cloud-computing company Dropbox have each been valued at $10 billion as well, following rounds of fundraising that totaled $347 million and $507 million respectively. Another tech company that's been rumored for an IPO is Pinterest, which was valued at $5 billion in May of 2014. Other high-profile startup valuations include Elon Musk's SpaceX at $4.8 billion as of December 2012, Spotify at $4 billion as of November 2013, and Snapchat at $2 billion as of November 2013. According to Kalanick, Uber's tremendous growth is the main factor driving the company's valuation. "We're at least doubling every six months. It's probably more robust than that, but that's good enough… That's revenue," Kalanick told The Journal. And that growth has venture capitalists digging into their wallets to fund Uber. "It's probably the fastest international expansion that I've ever seen from a venture-backed company," said Benchmark venture capitalist Bill Gurley. Benchmark is Uber's largest institutional investor, after funding the company in 2011. Uber launched its service in 2009 in San Francisco, and today the company operates in 130 cities worldwide. Kalanick has also stated that the company has eclipsed the 1,000-employee mark and plans to continue adding employees as revenue increases.